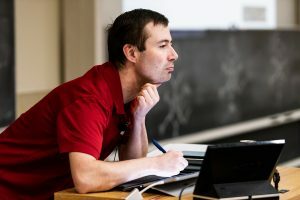 Bowman sailed through his own organic chemistry classes in college, so he may not be able to share his students’ anxiety about diagramming chemical reactions. But his fierce commitment to their success, and his sympathetic ear during their setbacks, have earned him something of a cult following among the hundreds of students he teaches every year. Quick with a laugh, often at his own expense, Bowman brings his windowless office full of papers to life. On his sweatshirt he sports a lapel pin marked “Ne” — neon, the 10th element — honoring 10 years of service to the chemistry department. Organic chemistry is a required course for many majors, and vital for preparing for next steps like medical school. So most of Bowman’s students are not chemistry majors and may be anxious about getting through an infamously tough class outside of their main discipline. Bowman says that anxiety about failure can create a self-fulfilling prophecy. But he concedes that organic chemistry is a little “alien,” without the tie to real-world experience found in other sciences like physics or biology. Organic chemistry is a required course for many majors, and vital for preparing for next steps like medical school. “It’s more like math than any other subject,” says Bowman, in that a lot of memorization up front lays the foundation for flexible problem solving later on. And, like math, the class is cumulative, so early lessons have to be mastered to succeed at the end of the semester. Except for a brief flirtation with adopting a disingenuous professional style in the classroom — “It backfired tremendously” — Bowman has excelled at guiding his students by being himself. He’s relaxed and funny, with occasional bursts of energy when a joke comes to mind. And he insists that his students call him by his first name. 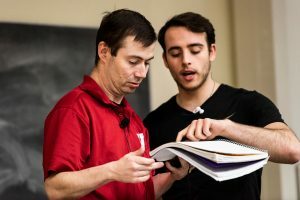 His warmness has won him fans from among his students, some of whom share Bowman’s messages of encouragement and cheer on his love of Dr Pepper on a popular Facebook page spoofing university life. “I was dreading taking o chem, but the first semester went really well, and I’m excited to take the second semester since I’ll get to take it with Matt again,” she says. After growing up in the small town of Wray, Colorado, Bowman earned his undergraduate degree at the Massachusetts Institute of Technology. While working at a pharmaceutical company in Germany after graduation, he took advantage of the then-nascent internet to apply to UW–Madison’s graduate program in chemistry, one of the few with an online application, to avoid expensive international postage. 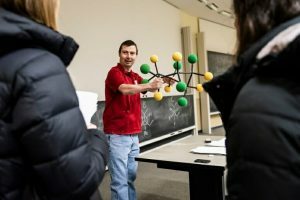 Bowman returned to his alma mater a couple years after earning his doctorate to take a position as assistant director of organic chemistry lab sections. 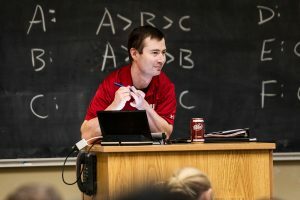 Along with his teaching assistants, Bowman now teaches both semesters of general organic chemistry as well as a single-semester organic course and the lab that accompanies it. Bowman struggled as an undergraduate, barely passing biology and even earning some Cs in chemistry. “And yet I still ended up with my dream job,” he says. Bowman also creates new experiments for the lab section. He’s developed a lab that incorporates the social behavior of bacteria and one based on the reactions behind glowsticks, which will require the lab upgrades now being added to the chemistry building to perform safely. 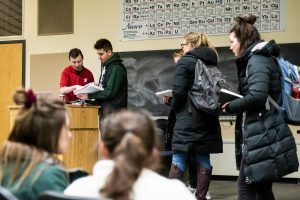 And the new, roomier lecture halls included in the building overhaul have Bowman excited about the chance to move freely among his students during class. When lecturing, Bowman eschews PowerPoint for live drawing, so his students can see his work and follow along. The class is recorded and Bowman offers his notes to students after class, helping meet the needs of diverse learning styles. “The main resource I can provide students with is problems,” says Bowman. When some students inevitably struggle with the class, Bowman is there to listen and encourage growth over resignation. Each class, Bowman hands out an ungraded set of problems to practice with. Before exams, he offers up several example tests. He’ll camp out at Union South on weekends, grab some Babcock Hall ice cream, and walk through problems with students during extra office hours. “A lot of people’s big learning experience is getting a bad grade — and how they deal with it,” says Bowman. Many students may feel the pressure to excel in every class to secure a spot in a competitive medical or graduate program, making anything less than an A feel like a career ender. Bowman reassures them that challenges are healthy and, despite the competition, grade perfection isn’t required for happiness and success. After all, Bowman tells his students, he struggled as an undergraduate, barely passing biology and, yes, even earning some Cs in chemistry. “And yet I still ended up with my dream job,” he says. Bowman is relaxed and funny, with occasional bursts of energy when a joke comes to mind. And he insists that his students call him by his first name. Find the original posting here.